Listen to song clips or buy Wherever You Are from Songs4Worship.com! The Bottom Line: No other band in Christian music delivers roots-rock and lyrical integrity like perennial favorite Third Day. So after a difficult year of personal and professional struggles and losses, fans eagerly anticipated the album that would emerge. Wherever You Are, 3D’s 8th release finds them in a contemplative, worshipful place. A place of honesty and hope. "We want to convey that wherever you are, whoever you are, whatever you are going through, God is ready to meet you right there," says lead singer Mac Powell of the albums’ intent. 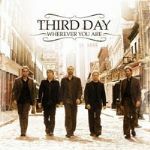 Produced by Brown Bannister and Third Day, Wherever You Are will encourage people from all walks of life—especially anyone walking through the valley. Featuring: 12 songs including “Tunnel,” “Cry Out To Jesus,” “Communion,” “Carry My Cross,” “Mountain of God,” “Love Heals Your Heart” and others.